In 1976 The United States Mint began to consider abolishing the current large size dollar coinage or making a new coin that was smaller and lighter in weight. Although Eisenhower dollars never widely circulated, the U.S. Mint and The Department of the Treasury was intent on keeping the one dollar coin. Keeping with the times, it was decided to portray a woman on the new smaller coin. 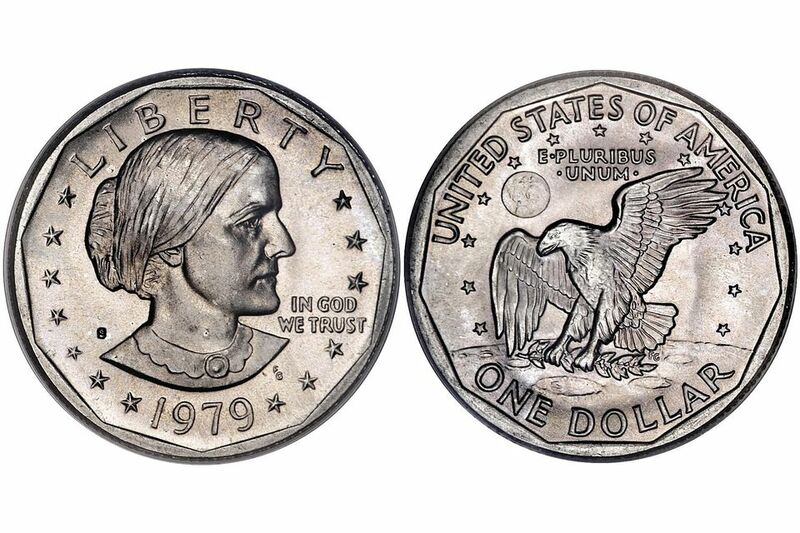 It was decided that Susan B. Anthony, a pioneer of women's rights, would be portrayed on the new coin. Research indicated that the coin could easily be confused with a quarter, so an eleven sided rim was included in the design and a marketing campaign was mounted to educate the public. All of this was to no avail. The public still confused the new coin with a quarter and it never circulated widely. The reverse used the same design that was used on the previous one dollar coin, the Eisenhower dollar. No coins were made from 1981 through 1998. However, in 1999 an additional run was made to meet the demands of the vending machine industry. The next year the Sacajawea dollar was introduced. Prices for Susan B. Anthony dollars are affordable for all type of collectors. In 1979 mint marks were still added to coin dies by hand. A mint worker preparing a die to be used at the San Francisco mint for the production of Proof coins broke the metal punch that was used to impart the mint mark into the die. This process involved the worker holding the metal punch on the die while striking it with a heavy hammer. The hard metal that the die is made from caused the mint mark punch to shatter. A new metal punch used to impart the mint mark into the die was made by an artisan at the mint with a slightly larger and clearer "S". Since this happened near the end of the production run, the Type 2 (clear and well formed mint mark) is the rarer or of the two types of 1979 proof Susan B. Anthony dollars. This same sequence of events played out again in 1981 and resulted in two types of Proof 1981 Susan B. Anthony Dollars. The following are popular errors and varieties that Susan B. Anthony (SBA) One Dollar Coin collectors look for. These coins usually carry a premium and are valued above a common coin. 1979 Philadelphia P Wide Rim (or "Near Date") Date is closer to the rim than previous 1979 issues. The following table lists mint production numbers for the number of Susan B. Anthony (SBA) One Dollar Coin produced at each mint facility. Where possible, production numbers by strike type are noted. How Much Is My Susan B. Anthony (SBA) Dollar Worth? How Much Is My Presidential Dollar Worth? How Many Sacagawea and Native American Dollars Have Been Minted? How Much Is My Eisenhower Dollar Worth?